1 1/4" NPT top discharge. 1/8" screen size solids handling, max outflow 2200 GPH, max head 29 feet, 3450 RPM, 2 pole, 120 vac, votex ABS impeller. 1.3 HP, 304 Stainless Steel construction. 20 foot power cord included. 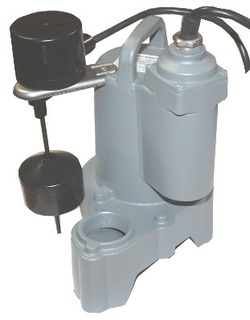 Float Switch with 20' cord available at additional cost. fish ponds, residential and watewater discharge. 2" NPT top discharge. 1.5" solids handling, max outflow 5900 GPH, max head 40 feet, 3450 RPM, 2 pole, 1 HP & 1.5 HP, 120 VAC, self cooling design for long life. 304 Stainless Steel construction. 20' power cord included. 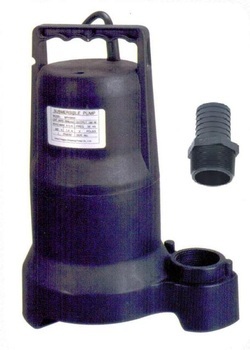 Float switch with 20' cord available at additional cost. 1.5" NPT side discharge. 1/8" screen size solids handling, max outflow 9000 GPH, max head 45 feet, 3450 RPM, 2 pole, 1/2 HP, 3/4 HP, 1 HP & 1.5 HP, Votex impeller. 304 Stainless Steel construction. 20' power cord included. Float switch with 20' cord available at additional cost. 2" side discharge. 1.5" solids handling, max outflow 6400 GPH, max head 41 feet, 3450 RPM, 2 pole, 3/4 HP, 1 HP & 1.5 HP, 120 VAC. All 304 Stainless Steel construction. 20' power cord included. Float switch w/20' cord available at additional cost. 1.5" NPT vertical discharge. 3/8" solids handling, max outflow 2600 GPH, 2 pole, 4/10 HP, Votex impeller, float switch for automatic operation. 120 VAC. 20 foot power cord included. 1.5" NPT vertical discharge. 1.5" solids handling, max outflow 6000 GPH, 2 pole 4/10 HP, Votex impeller, float switch for automatic operation. 120 VAC. 20' power cord included. 1.5" verticle discharge. 1/2" solids handling, max outflow 5880 GPH, 1/3 HP, 1/2 HP & 3/4 HP, 10 vane Vortex impeller, 300 series SST parts, oil filled motor, automatic overload reset, BB construction, piggy back float switch for automatic operation, 20 foot cord with plug, 120 VAC.